The Cotton Houses. A very good artist's impression of what the houses looked like. This is a rear view of the properties originally painted from memory by Edward Lightfoot in 2003 under the instruction of Mrs Harriet Grainger, and supplied to me by Mrs Sheila Davies (Harriet's daughter). The Cotton Houses were situated on the corner of Manor Lane and St, Ann’s Road, Middlewich. We lived at number 6 Manor Lane from 1953 until 1958 when they were condemned. I think they were owned at the time by the Smallwood family, relations of John Garner the local builder, who demolished them within a couple of years and also built the houses which are now on the same site. There were six cottages in total, and I believe three of them were about four hundred years or more old at that time, ours being one of them, and one of the smallest. There were three rooms in total in our rented cottage, two downstairs and one up. And he was only 5' 7" tall. I think some years earlier the cottage that we lived in had been reduced in width to allow a hallway to be built in the already larger premises next door. This would then allow this corner house to have three doors. It already had a door onto Manor Lane and one onto St Ann's Road and the new rear door, I assume, was to allow easy access to the new, then modern, outside toilets that were some way over to the far-side of the communal backyard. I will always remember those dingy toilets with the proverbial nail in the wall. I am only assuming the hallway and the toilets were built at the same time. The cottages' roofs were covered with slates, which were laid on top of the original thatched roof. I know this because the roof caught fire twice when we lived there, and I remember that on one of these occasions, a fireman shouting that it was the thatch that was on fire. It was caused by sparks coming through one of the chimney walls. The walls of the three oldest cottages which ran along the Manor Lane boundary were made from wattle-and-daub. The two cottages that were built on the boundary of St., Ann’s Rd., were later additions, after part of the original building must have been demolished. I believe this image is of the front of the Cotton Houses, from the Manor Lane side. 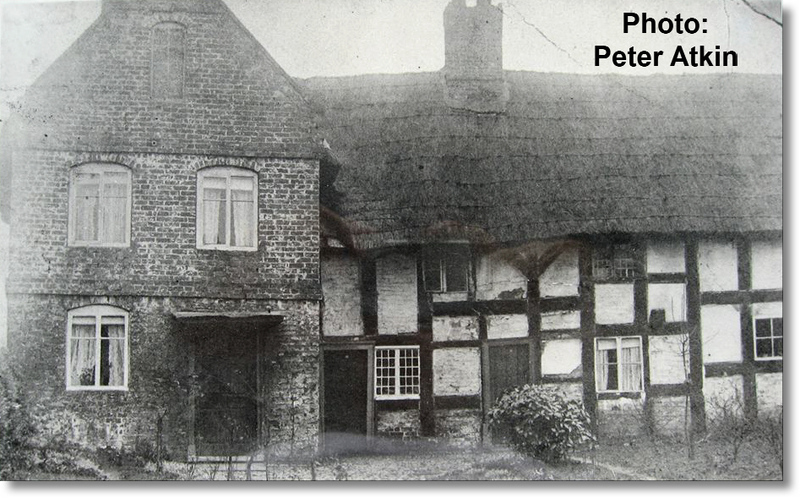 I am very grateful to Betty Williams of the Middlewich Heritage Society for finding this image in the Society's archives, where it was listed as 'unknown, but thought to be somewhere on St Ann's Road'. When I first saw the above black and white image, I thought that it was of Derbyshire's (market gardeners) cottage which is still just across from the Manor Lane/St. Ann’s Road junction, but if it is a true image the garden would have been too large to have been Derbyshire’s, which is on the road side. This image would also have had to have been prior to their conversion into six cottages, due to the lack of the extra chimneys on the right-hand side and the missing slate roof that was laid on top of the thatch. The cottage that we lived in would have been the second door from the left. Everything looks right about it. It was one of the smallest of all the cottages and, as I mentioned before, the ceiling height was only about six feet or so. That's why the door looks small compared to the newer cottage on the left-hand side of it, which I think had an eight foot ceiling, judging by the windows. The walls were flush with one and other, and not set back as it appears in the image. There was also a massive fireplace in our living room and a large chimney breast in the one and only bedroom. It was definitely out of proportion to the size of the rooms. The fire place would have been in proportion, if it had once been one or two larger rooms either side of the chimney breast. I do remember that the bedroom window at the end of my parents bed being in the same place as shown in the image, the one below the chimney. The bed was above the door and the downstairs window. This image looks perfectly in proportion to how I remembered it in the late 1950’s. I do not recall the bricks in the gable-end though. I think it was painted white and there was a door in it, as shown in the image. I can remember our next door neighbour Mr Hall, who was a joiner, making a new door for it. I can only imagine that the chimney was in the middle of the original building, so it would have had to have been longer on the left hand side. This probably would have been the original footprint of the Cotton’s work and poorhouse. Allan Earl’s research also shows it was still a work and poorhouse in 1740. There may have been an extension built onto the right-hand end as well, as it seems to me to be one dwelling too short to have been six cottages. When we lived there the end cottage that was on right-hand side also had an unattached brick wash-house with a big copper open topped coal fired boiler in it. Can anyone else add anything to the above information? The old house in the story is actually the original Pear Tree Cottage in St Ann's Road, which belonged to my great grandfather Tom Turney. Here is a better copy from my family archive. When this diary entry was re-published at the end of September 2017, Ann Birtwisle-Brown got in touch to tell us that her great great grandparents, Isaac and Martha Sant had lived in the Cotton Houses at the time of the 1871 census. 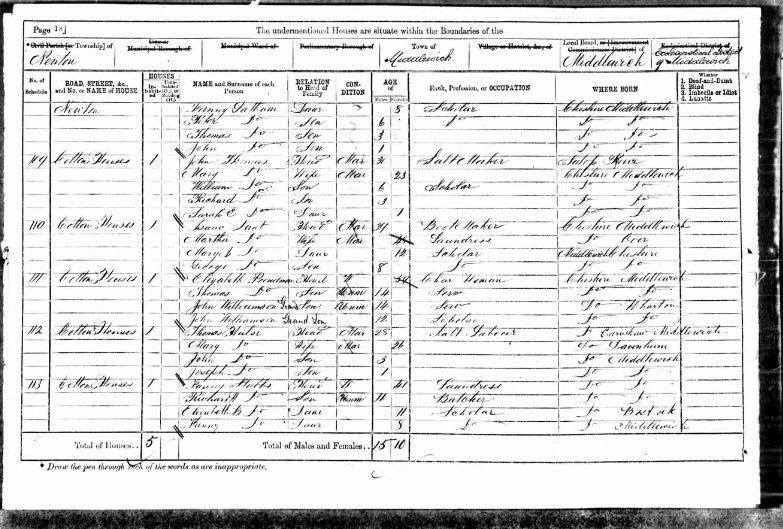 Their daughter Mary Ann, then aged 12 was Ann's great grandmother (ATKIN(S)). We're grateful to Ann for supplying this information and for permission to use it. As she herself says it gives us an opportunity to learn something of one of the families living in the Cotton Houses all those years ago. -Ed. My grandparents Harold and Kate Hatton lived at the Cotton Houses with my mother Doreen and my aunt Gwen until my mother was about 11 years old. They then moved to Stanthorne. I remember my mother taking me to see the houses before they were demolished. My mother and aunt also talked about playing across the road at Derbyshire's Market Garden.